Wow, that was quick! And this is for me? Thank you thank you thank you! *Hugs* And Akatsuki no Kuruma is one of my favourite songs of all time! How did you know? XD Again the extraction is great and I like the text you used to write "Dawn's Carriage". I don't see any reason for this to be deleted. Thanks so much! Like Moon-chan said, it's cool how the orange petal background matches the song. Oh and I see some weird orange stuff near her necklace. If you wanted to me to edit the necklace for you I could have (I did that with the Lacus on my userpage). It's just it doesn't match her skin colour. But thanks again, so much! 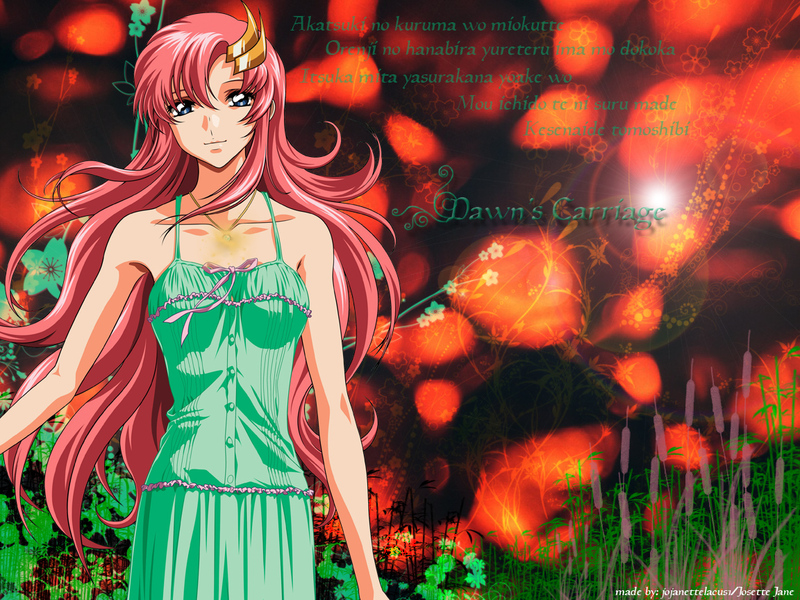 did lacus ever wear a green dress like that? You made the BG a bit too abstract and messy- the tone isn't very... compatible.